In this recipe, you'll learn to make your own lavender-infused honey for an ambrosial pound cake. The Zion Canyon Farmers Market is in its eighth glorious year and located just outside of Zion National Park. Although we are quite small, we have some of the most spectacular produce and goodies in the area! Our market is held just under The West Temple on the lawn of a wonderfully supportive local restaurant called The Bit and Spur. Every week we’re asked to bake for our Farmers Market Bake Sale Fundraiser. And since lavender is in season right now, I decided to make my locally famous Lavender Pound Cake and proceeded to use as many locally produced products as possible. 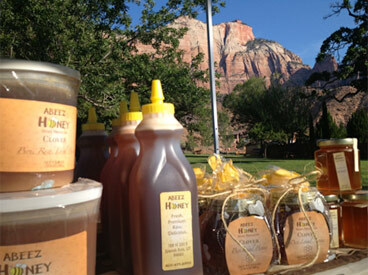 Abeez Honey produces raw, local honey for Utah residents and lucky visitors. Lavender Pound Cake with pastured organic eggs, Abeez Honey, Stone Ground Spring flour from Red Acre Farms CSA, Christiansen Family’s Farm Fresh Lard, and dried lavender. Place ¼–½ cup dried lavender blossoms in a clean quart jar. Fill jar with 1 to 1 ½ cups local honey. Seal tightly and set aside, occasionally mixing/stirring before resealing. Let sit for several days. Note: You can strain the honey—but holy cow is that a messy, time-consuming process! So I keep the blossoms in the infused honey. And the little bit of lavender looks quite lovely in the cake. Preheat oven to 375°F (adjust to 350°F if at lower altitude). In large bowl, with electric mixer on medium speed, mix butter and lard until creamy (about 2 minutes). With mixer on medium-low speed, add brown sugar a half cup at a time. Once all brown sugar is added, turn mixer on medium to medium-high speed to fully incorporate sugar (4-5 minutes). With mixer on low speed, add eggs one by one. Gently beat mixture after each addition. In a separate bowl, combine flour, baking soda, baking powder, salt, and cayenne. In another bowl, briefly whisk milk, yogurt, and vodka (if using). In mixing bowl, with mixer on low, alternate adding flour-mixture and milk-mixture until all ingredients are combined. Then add vanilla. Once ingredients are fully incorporated, gently fold lavender-infused honey into mixture.